Published: Oct. 23, 2012 at 08:28 p.m. 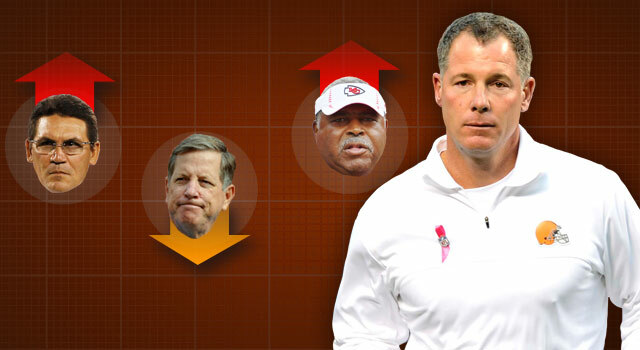 Updated: Oct. 24, 2012 at 08:46 p.m.
Pat Shurmur sits atop a list no NFL coach wants to be on. Welcome back to the ATL Warming Seat, where we discuss NFL coaches whose seats are getting warm as the weather cools. We have new company this week, thanks to some seismic rattlings down in Charlotte. That gave Philadelphia Eagles coach Andy Reid a temporary respite from his toasty chair. Good for Andy, who deserves a comfortable seat as he injests Michael Vick turnover footage. Shurmur holds on to the top spot for a third consecutive week after the Browns stumbled to 1-6 with their loss to the Indianapolis Colts. It's never a good sign when -- following an indefensible coaching decision -- CBS cameras catch your new owner unleashing a furious leg cross. Did you see the velocity of that appendage? Rivera makes a grand entrance thanks to the dual whammy of another demoralizing home loss coupled with the firing of general manager Marty Hurney on Monday morning. Rivera is in grievous danger right now. Let's face it: When you're asking Brady Quinn to save your season -- and, in turn, your job -- you're in a bad place. This week on That's Norv!, the Chargers travel to Cleveland to face one of football's worst teams! Turner. Shurmur. A Warming Seat showdown with the top spot on the line! Some conservative playcalling on offense late in the game could've put Garrett in a very vulnerable position this week, but Dallas' defense stepped up to make the coach look smart.